La Rosa dei Venti is located in Venice, in Riva San Biasio, on the scenic road that goes along Saint Mark's Basin (the water basin in front of Saint Mark's Square) starting from Saint Mark's Square all the way to the Biennale Gardens, the venue for the Biennale Arte and Biennale Architettura exhibitions. From the windows and terraces of the Bed and Breakfast you can enjoy a wonderful view over Venice that spans Saint Mark's Square, the island of San Giorgio, and the Lido of Venice, and close to Rosa dei Venti you will find typical Venice in the narrow streets and small squares of Castello, the most Venetian of neighborhoods. When staying at our B&B La Rosa dei Venti clients are our guests and they are treated with the best care possible: rooms with bathroom (and hydro-massage! 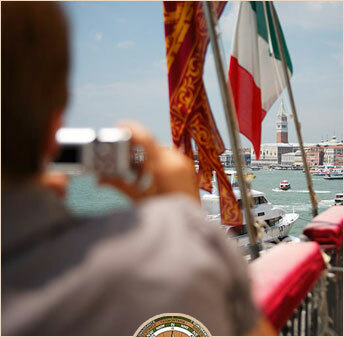 ), a rich buffet-style breakfast and useful tips to discover our Venice, the most beautiful city in the world. "This book will tell the story of all the things that Marco Polo, noble and wise citizen of Venice, has seen with his own eyes…"